Conformational features of pyridine- and pyrimidine-based bistriazolyl anion receptors were assessed by multidimensional, heteronuclear NMR spectroscopy. NOESY correlation signals suggested preorganization of both host molecules in solution in the absence of anions. In addition, only a single set of signals was observed in 1H NMR spectra, which suggested a symmetrical conformation of anion receptors or their conformational exchange that is fast on the NMR time-scale. Furthermore, the predominant conformations of pyridine- and pyrimidine-based anion receptors are preserved upon addition of chloride, bromide, and acetate anions. 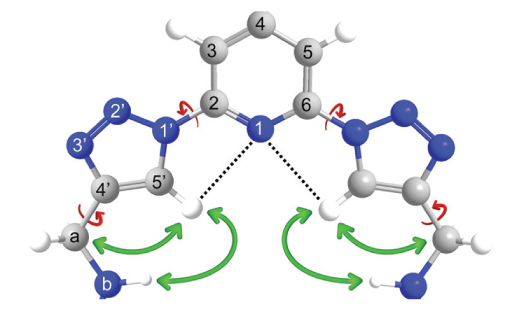 Chemical shift changes observed upon addition of anions showed that NH (thio)urea and triazole protons are involved in anion-receptor interactions through hydrogen bonding.